Select the SFP transceiver that best suits your needs from a range of high performance copper SFP (Small Form-Factor Pluggable) transceivers for sale to the United States, Canada and Globally. Copper SFP transceivers are typically used for data transmission over short distances since a copper cable is more economical than fiber optic cables for short distances. Data is sent over shielded or unshielded twisted pair cable. 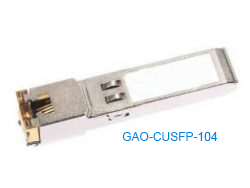 GAOTek’s Copper SFP transceivers support 1.25 Gbps data rate for a reach of up to 1.2 miles (2 km). GAOTek’s robust Copper SFP transceivers are hot pluggable devices with up to 1.25 Gb/s bi-directional data links over Cat 5 cable. The come with a compact RJ-45 connector assembly. They are built to comply with Gigabit Ethernet standards specified in IEEE Std. 802.3, and are based on the SFP multi-source agreement (SFP MSA). The 1000BASE-T physical layer IC (PHY) can be accessed via I2C for access to all PHY settings and features. These transceiver modules are ideal for small form-factor network interface cards (NIC) and uplinks. Typical applications include LAN 100BASE-T, switched backplanes and router-server interfaces.